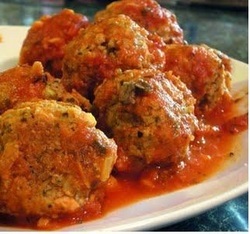 Grated zucchini replaces bread crumbs in this meatball recipe. In a large bowl, mix all ingredients except tomatoes. Form mixture into 18 golf ball sized balls. Place in baking dish. Bake 30 minutes, or until no longer pink in the middle. Heat skillet over medium heat. Add tomatoes with juices. Add meatballs. Cook 5 minutes.